Today, the youngest BurgerBuster (Happy Meal) and I headed out to meet a good friend in town from Montreal. As we headed down Wilshire, we noticed Literati Cafe, and we figured that they would have a balanced menu, which would make everyone happy. As luck would have had it, Literati Cafe had a couple of burgers on the menu, so we ordered a bunch of the $14 Literati Burgers. The bun was a brioche, which came from La Brea Bakery, but I don't think that it was delivered on the day that I consumed it. It looked like a brioche, but is was a little dry, and it was nearly flavorless. It was nicely toasted, though. Mine came out a perfect Med Rare, as ordered. The sear--meh--they grilled it, but it was nicely seasoned on the outside, so that generally made up for a lack of sear and crust. There was bit of char from the grill, so I got a satisfying, small taste of carbon. The meat was funky, but in a good way. The dry-aged front note of what tasted like a blend of Angus rib and chuck was hard hitting. It really let me know that someone had aged the hell out of some beef. The youngster found it a little gamy, but I found that the most satisfying part of the experience. While they touted Niman Ranch pork and lamb on the menu, they didn't make the same claim about the beef. That should have been a good sign, because Niman Ranch burgers have never been particularly flavorful, since the meat generally shows up pre-ground. For $14 bones, Literati should have been grinding that in-house, anyway. Sadly, the middle note from the beef was wholly lacking--I expected a rush of blood and iron to follow up on the funk, but it did not. The perfectly melted Aged White Vermont Cheddar and Gruyère did a capable job of filling the flavor voids, left by the bloodless beef and bland, brioche bun. The Cheddar provided the salt and iron notes, while the Gruyère filled in a bit of sweetness. It came together in a way that mostly worked. It was a backdoor approach to achieving a full flavor profile, but it succeeded, kind of. The issue was that the flavors from the cheeses were noticeably delayed since those notes had to make it through the fat that the cheese exuded. It took a moment to appreciate the clever use of the cheeses to nearly round out the dish. The grind was medium. 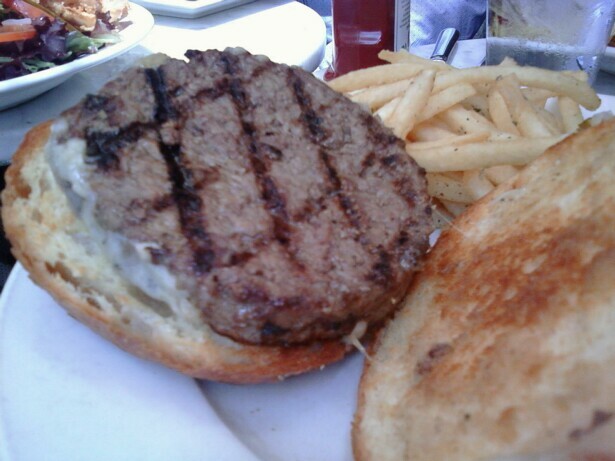 The beef was not over-manipulated, so the patty had a pleasant, but somewhat weak, mouth feel. The beef was not particularly firm, so it wasn't completely satisfying. It seems that they replicated Niman Ranch pre-ground beef's bland texture and flavor but they worked in some funk. It was odd, because they seasoned the outside, but the inside was bland. The cheese could not compensate well enough to make up for that. Clever only took this burger so far. Beef to bun ratio--perfect. The dryish, bland bun was a competent delivery vehicle, which did not upstage the patty. 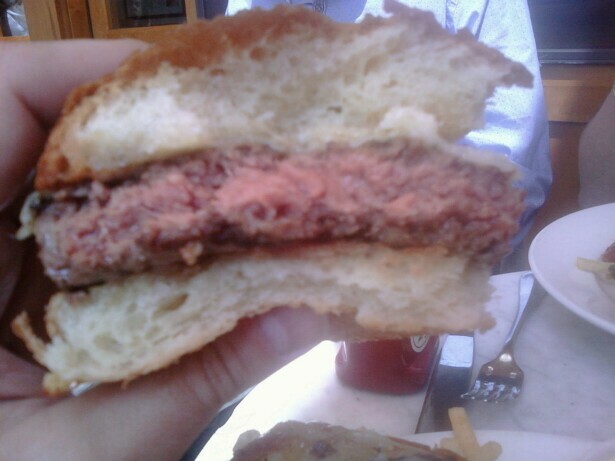 The Roma tomato slices that accompanied the burger were utterly foul, however. It's as if they were vacuum-packed overnight with a raw salmon. Standards!!! The fries were remarkably savory. I had to ask the waitress if they were cooked in beef tallow. She checked with the kitchen, which assured her that they only used canola oil. Either way, they were marvelous--thin, crisp, and rich in flavor. They were the highlight of the meal. Damn good, but in no way did they make up the value gap to get us to anything resembling $14 worth of quality and deliciousness. Honestly, had they swapped out sirloin for that bland blend of beef, this could have been marvelous. Well, had they used flavorful meat AND had they seasoned the blend, then it would have been marvelous. Oh, and gotten a good sear on it. And....used a fresh bun. Bah...never mind. You can't fix unsatisfying. Burger Review : Literati delivered a merely OK burger, which cleverly concealed the most of the shortcomings of its beef. Being clever is not the same as being good. 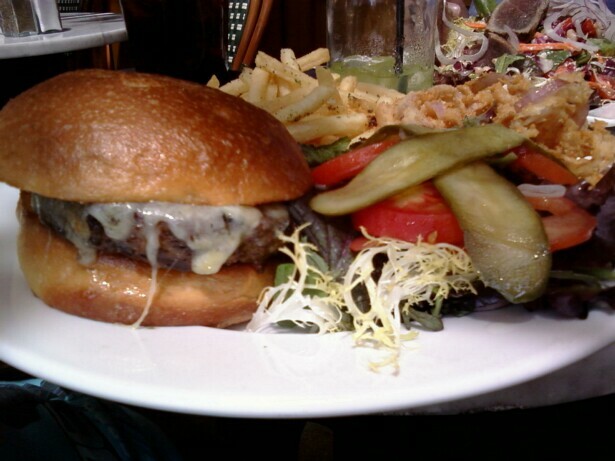 Fortunately for Literati, the cuisine bar in Brentwood was set VERY LOW in terms of burgers. It beat the hell out of cheeseburger serving neighbors Tavern and Barney's Gourmet Burgers. The fries were damn good.